The pH of soil indicates the strength of acidity or alkalinity in the soil solution which bathes soil constituents, plant roots and soil micro-organisms. Soil is neutral when pH is 7, it is acid when pH is less than 7 and alkaline when it is greater than 7. The pH scale is logarithmic, so a difference of a unit is a tenfold difference in acidity or alkalinity (eg. pH 5 is ten times more acid than pH 6). Traditionally, soil pH has been measured in the laboratory by inserting a pH electrode into a suspension of one part air-dried soil and five parts pure water (1:5) after it has been shaken for an hour. This should be undertaken on a composite sample collected from a paddock and submitted to a laboratory for analysis (refer to the two following information notes on soil sampling). The calcium chloride method has been used in recent times: where a weak calcium chloride solution is used in place of water. This is a more robust method of measuring pH as it is less affected by seasonal variation in soil salts, or additions of fertilisers. This newer method gives a lower reading by up to 1.3 pH units compared to measurement in water. It is important therefore to state which method has been used when assessing pH. All pH values presented in this website have been measured in water. 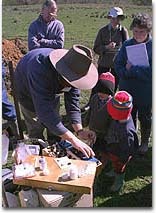 A portable kit (Raupach's Indicator) has been widely used to provide a ready indication of soil pH in the field. A small sample is collected and an indicator solution is added to form a paste. The paste is then coated with barium sulphate powder. The colour of the powder is then compared with a colour chart. This method is not as precise as the laboratory methods. The kits deteriorate with age and therefore should be discarded after 12-18 months. Soil pH affects the availability of soil constituents to plants and soil micro-organisms. For most plants, the ideal soil pH (water) test result is pH 6 - 7.5, although many will tolerate pH 5.5 - 8.5. However, the tolerance to extremes in pH varies between plant species and within species. Some plant species have quite different preferred pH ranges (eg. lucerne 6.0 - 8.5, celery 6.0 - 7.0, potatoes 5.0 - 6.0). Therefore, consideration of the need for soil amelioration will depend on individual circumstances. 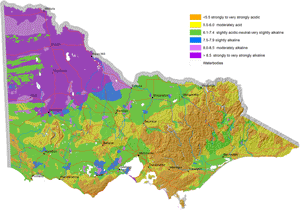 The pH of the surface soils in Victoria ranges from pH 4 to pH 10. These extremes in alkalinity and acidity present problems for the production of many agriculturally important plant species and their symbiotic rhizobia. Due to the complexity of soil chemistry, it has often been difficult to confidently identify the cause of poor plant growth or nodulation. However, aluminium and manganese toxicities and molybdenum and phosphorus deficiencies are probable causes of poor production in many strongly acid soils. On the other hand, lime induced zinc and iron deficiencies often occur in alkaline soils. These new maps of surface and subsoil pH (as measured in water) were developed as part of the DEDJTR Systems for Enhanced Farm Services (SEFS) program in May 2014. They have been created from soil data observations within the Victorian Soil Information System (VSIS) and provide a statewide overview of pH (water) for soil surface and upper subsoil horizons across Victoria. Data in VSIS is compiled from soil and land surveys conducted over the past 50 years as well as soil profiles examined for research and extension. Nearly all of the data comes from pits, auger holes or deep intact cores, i.e. single points in the landscape. As new data becomes available, it will be added to VSIS. Therefore, the maps should not be seen as a representation of the current pH status of Victorian soils as pH can change significantly over time. Also, the intensity of source data used to produce these maps varies considerably across the state. The maps cannot indicate soil pH at the local scale, but can be used as a generalised indication of likely pH ranges at a regional scale and broadly how pH is likely to vary down the soil profile. Considerable variations in soil pH are likely within a region, depending on factors such as soil type, rainfall and land management (e.g. lime application). Nevertheless, these maps provide a useful indication of pH trends across the state. A number of Victoria’s soils are naturally acid while others are naturally alkaline. This is due to the effect of natural soil forming processes, (such as biochemical transformations, leaching, erosion, deposition) occurring over hundreds to thousands of years on the soil parent material. Consequently, areas of high rainfall such as those on the coast and mountains, have more acidic soils compared to more arid areas, due to the more intense leaching and cycling of chemical and biological reactions in wetter climates. Surface soil pH is generally acidic in the Eastern and western Uplands, the Strzelecki and Otway Ranges and north-eastern Victoria. The acid soil conditions in these areas are known to limit plant production in agricultural industries. For example, crops and pastures such as barley, phalaris and lucerne have been limited by aluminium toxicity in north-eastern Victoria and the Central Highlands. Molybdenum deficiencies have limited pasture production in Gippsland. 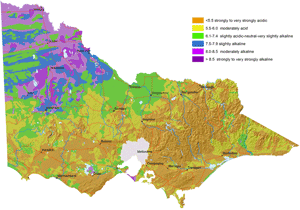 Soil pH is high and alkaline in north-western Victoria, i.e. Mallee and Wimmera. Field crops grown on these soils have experienced zinc deficiencies. Herbicide persistence has also occurred in the strongly alkaline soils. Agricultural practices also have the potential to acidify soils. For example, soils under sub clover based pastures, leguminous crops such as lupins, and where ammonium fertilisers are used. Management practices can be used to reduce the impact of acidification. These include use of perennial and deep rooted species (e.g. phalaris), and avoiding acidifying fertilisers. Ultimately, application of lime will be needed to combat acidification. Soil Acidification Animation. In contrast, alkalinisation has also occurred in some soils. Specifically, irrigation with alkaline bore water and fertilising with nitrate fertilisers will increase soil pH. Movement of an alkaline water table will also alkalinise soil. Of course, applying lime will alkalinise soil. A statewide soil chemistry data set based on samples submitted from farms, vineyards and orchards between 1973 and 1994, has also been used to map soil pH. Each datum was from a composite sample of 20 to 30 cores representing the 0-10, 0-15 or 0-30 cm depth of soil taken from the main soil type in each paddock. Samples from national parks, urban land and sport and recreational turf were excluded from the data. Collated data included nearest location and pH (1:5 soil:water). The map was generated by applying geo-statistical techniques (‘kriging’) to the mean pH of the locations. It indicates the geographic trends in the acidity and alkalinity of surface soils across Victoria's agricultural land This map cannot indicate soil pH at the paddock scale and it should only be used as an indicator of likely pH at a regional scale. Considerable variations in soil pH will occur within a region. This map does not substitute for a soil test.It is important to note that the map only considers surface soil pH. Lime is usually used to increase soil pH in strongly acid soils. The quantity of lime needed will vary between soils. Generally, coarse textured soils (e.g. sands) need less lime than finer textured soils. Also, soils with little organic matter need less lime than peaty soils. A lime requirement test will incorporate these affects when used to determine the amount of lime needed to raise soil pH. Other factors needed to determine an appropriate lime rate include current soil pH, target soil pH for the specific plant, lime quality, application method and economics. Impact Impact of Acid Soils in Victoria publication. This report was prepared by the former DPI in consultation with the Acid Soil Steering Committee. It aims to improve the awareness of the impact of soil acidification and identifies issues that should be considered in developing a strategy to manage acid soils.